New research suggests that a long life is no accident. 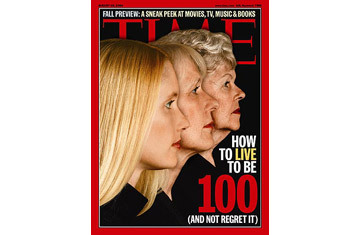 So what are the secrets of the world's centenarians? Scientists working for the U.S. National Institutes of Health and Japan's Ministry of Health have been following oldsters like Toguchi since 1976 in the Okinawa Centenarian Study (OCS) and they've learned that he's typical. Elderly Okinawans tend to get plenty of physical and mental exercise. Their diets, moreover, are exemplary: low in fat and salt, and high in fruits and vegetables packed with fiber and antioxidant substances that protect against cancer, heart disease and stroke. They consume more soy than any other population on earth: 60-120 g a day, compared to 30-50 g for the average Japanese, 10 for Chinese and virtually 0 g for the average American. Soy is rich in flavonoids  antioxidants strongly linked to low rates of cancer. This may be one of many reasons why the annual death rate from cancer in Okinawa is far below the U.S. rate. But it's not just what Okinawans eat; it's how much. They practice a dietary philosophy known as hara hachi bu  literally, eight parts out of 10 full. Translation: they eat only to the point at which they are about 80% sated. That makes for a daily intake of no more than 1,800 calories, compared to the more than 2,500 that the average American man scarfs down. And as scientists have learned from lab animals, the simple act of calorie restriction can have significant effects on longevity (see box). Aging Okinawans also have a much lower incidence of dementia  Alzheimer's or other forms of senility  than their U.S. and European counterparts do. Part of that may also owe to diet; it's high in vitamin E, which seems to protect the brain. But perhaps just as important is a sense of belonging and purpose that provides a strong foundation for staying mentally alert well into old age. Okinawans maintain a sense of community, ensuring that every member, from youngest to oldest, is paid proper respect and feels equally valued. Elderly women, for example, are considered the sacred keepers of a family's bond with the ancestors, maintaining the family altars and responsible for organizing festivals to honor them. OCS data show that elderly Okinawans express a high level of satisfaction with life, something that is not as true in Western societies, where rates of suicide and depression are high among the elderly. Need convincing evidence that our modern lifestyle can shorten lives? Look what happens when Okinawans move permanently off the island. They pick up the diet and cultural behaviors of their adopted country  and within a generation, their life-spans decrease and their rates of cancer and heart attack zoom. Even on the island, young males are following the seductive, virulent American style and renouncing imo for hamburgers. "Okinawan male life expectancy used to be No. 1 in Japan," says Dr. Makoto Suzuki, leader of the study of Okinawan elders. "It started to decline 10 years ago and hit 26th out of 47 prefectures in the 2000 census. I expect it to decline even further in the next census." What costs are associated with a longer life?